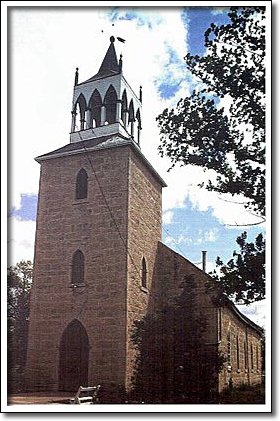 Between 1845 and 1849 construction proceeded on a new stone church to serve the burgeoning Parish of St. Andrew’s. The building was designed by Archdeacon William Cockran (1798–1865) to serve the local community of retired Hudson’s Bay Company personnel and English mixed bloods. Archdeacon Cockran was instrumental in the establishment of the Anglican Church in Manitoba. Much of the stonework was done by Duncan McRae (1813–1898), a mason responsible for the construction of many of the best stone buildings from this early settlement period. Archdeacon Cockran’s design relies on the centuries-old traditions of the British parish church. St. Andrew’s was distilled to basic elements: a simple form, massive stone walls, small pointed windows, a steep roof and a full wooden steeple. During the 19th century, these traditions were in transition to a new architectural style, the Gothic Revival. In Manitoba, Gothic Revival became the favoured style for church buildings into the 20th century.